WazHack: WazHack beta 4 released - You've got Talent! WazHack beta 4 released - You've got Talent! Beta 4 is now live on wazhack.com! The big new feature of this release is the Talent System, which lets you improve your character in many different dimensions as you level up. I looked over all the wishes that the Guild Members have voted up in the Wish Council, and I found a great use for almost all the good ones. Anatomy - you extract more food from monsters you kill. Battle Magery - metal gear has a reduced affect on spell casting. Dual Wielding - allows you to usefully wield multiple weapons. First Aid - allows you to heal faster. 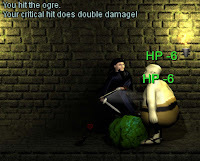 Magic Precision - gives you more critical hits with your magic. Shield Parry - protects you against receiving critical hits. Weapon Knowledge - gives you knowledge, ultimately a Dwarf's knowledge, of weapons. Weapon Precision - gives you more critical hits with weapons, even more for two-handed weapons. As you can see, each talent helps in different ways, and which ones you choose will depend on your playing style and what your immediate problems are. If you find that food is the biggest problem you have, get a little Anatomy. If you can never work out which weapon to use, go for Weapon Knowledge. Or if you just plain die a lot from being slowly beaten down, go for First Aid. 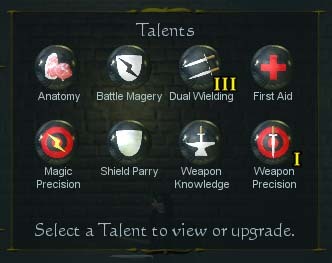 Some talents are useful generally, while others more so if you want to go for a specific type of character (such as a Battle Mage). There are 3 levels to each Talent, with the top level being extra potent. For example, if you have Dual Wielding Level 3, you can wield two weapons and each one attacks 60% faster. Of course, you need two good single-handed weapons and no shield, but wow, do you feel like a ninja! Weapon Knowledge will reveal information about your weapons. This can save you a lot of Identify scrolls and helps you ensure you're fighting with your best weapon. Note that weapon knowledge does not take into account your current skills, merely the intrinsic quality and enchantment of the weapons. Regardless of your Weapon Knowledge, unique "artifact" weapons now reveal their might as soon as you wield them. A few shopkeepers sent in bitter complaints about that change. Critical Hits were in the earlier betas, but they were just a guaranteed hit based on a 1 in 20 chance (a "natural 20" on a d20). Now they also do double damage. Watch out though: monsters get them just as much as you do (but they can't get Talents to help them). Performance of the default "Good" graphics setting has been tuned to work well on lower-end machines, but if you have a more powerful machine, be sure to turn up the graphics to "Fantastic" in Options -> Graphics. There are many other improvements in beta 4 (like more arrows... but watch out: monsters can use them now too). I hope you enjoy the update - keep sending me bug reports, no matter how minor. As always, you can play WazHack online at wazhack.com. If you've played very recently, you may need to use Ctrl-Reload to clear your browser cache. WazHack beta2 is up - Join the Guild!